The table below aims to give an outline of some of the key issues in Christian belief and how the three traditions view these issues. We have tried to state what might be called the ‘representative’ view of each tradition, though there are obviously differing views within each of them e.g. the diverse range of opinions on the presence of Christ in the Eucharist. Apostolic Succession This is an important part of Orthodox belief and ensures continuity with the church that Christ founded. With the exception of the Anglicans and some Lutherans, this idea is rejected. Rather it is important to emphasise continuity of teaching with that of the apostles, rather than a direct line of succession. As in Orthodoxy, this is of vital importance to the church. There is also some degree of mutual recognition of the validity of Orthodox ordinations. Bible – Composition of Accept the 39 Old Testament and 27 New Testament books, but also a collection of books not found in the original Hebrew Bible. These are known as Deuterocanonicals i.e. a second canon of scripture. Protestants reject the deuterocanonicals as not being inspired scripture and term them Apocrypha (Greek: ‘Hidden Things’). Agrees with Orthodoxy as to the validity of these books. Clergy – Qualification for Deacons, Priests and Bishops must be male, but deaconesses are permitted, though the order is dormant. Priests and deacons may marry before ordination but not after. Bishops, on the other hand, must be celibate. The majority of Protestants do not require celibacy as a condition of election to the clergy. Many churches practice female ordination, including those within the Anglican communion, where the issue of female episcopacy is currently being discussed. All clergy are required to be male. Priests and Bishops must also be celibate, with the exception of Eastern Rite Catholics and Anglican married clergy who subsequently convert to Catholicism. These groups are allowed to have married priests. Eucharist – Significance of Commonly termed the ‘Mystic Supper’ or ‘Divine Liturgy’ – This makes present Christ’s sacrifice and therefore forgiveness of sins is obtained through it. It is also an encounter with the Risen Christ. The Eucharist, like Baptism is only a symbol of grace. The sacrificial nature of the Eucharist is also rejected. The position is similar to the Orthodox. The Eucharist is also known as the ‘Holy sacrifice of the Mass’. Eucharist – Presence of Christ in During the Eucharist, the Priest calls down the Holy Spirit (in Greek: epiklesis) upon the gifts (the bread and the wine). They then change into the actual body and blood of Christ. The precise way in which this happens is a divine mystery. The bread and wine, being symbols, do not change substance. There are however, a wide variety of views held within Protestantism on this subject (e.g. some Anglicans accept the Catholic view, whereas Baptists deny it). As in Orthodoxy, the Priest invokes the Holy Spirit during the Mass. However, the consecration becomes effective through the Priest, who acts in the person of Christ. The gifts change completely into Christ’s body and blood and this change is termed ‘Transubstantiation’ i.e. the outward appearance remains the same, but the substance changes. Eucharist – Distribution of The consecrated elements can only be received by members. 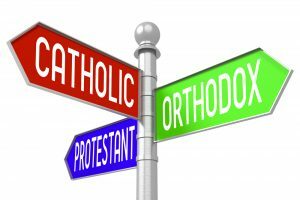 Orthodox policy is to have communion in both kinds (i.e. both the bread and wine are given to those present). The elements are usually offered to all Christians who feel able to partake of them. The vast majority of Protestant churches have communion in both kinds. As with Orthodoxy, only members of the church may receive. In some Catholic Churches, the bread alone is given to the congregation, the Priest receiving the wine. However, it is becoming common for churches to have communion in both kinds. Holy Spirit The third person of the Trinity, proceeding from the Father alone as in the original Nicene Creed. The Father sends the Spirit at the intercession of the Son. The Son is therefore an agent only in the procession of the Spirit. The Holy Spirit proceeds from both the Father and the Son. The Nicene creed includes the filioque (Latin: ‘and the son’). Agrees with the Protestant view. Ambrose of Milan (340-397) wrote: ‘When the Holy Spirit proceeds from the Father and the Son, He is not separated from the Father, He is not separated from the Son’. Marriage and Divorce Marriage is a mystical union between a man and a woman. Divorce is generally only allowed in cases of adultery, though there are exceptions. Marriage is a contract, but is not unbreakable. Divorce is discouraged, but permitted as evidence of human weakness. Some denominations permit remarriage in church. Marriage is seen as an unbreakable contract & a type of Christ and the church. Remarriage after divorce is not permitted unless there is some canonical impediment to the marriage. In this situation, an annulment may be granted. Mary – Assumption and Immaculate conception of The Assumption is accepted and it is agreed that Mary experienced physical death, but the Immaculate conception is rejected. Orthodox belief is that the guilt of original sin is not transmitted from one generation to the next, thus obviating the need for Mary to be sinless. Both are denied. The claim that Mary was sinless is rejected – only Christ was sinless. Both are dogmas of the church. The church has not as yet decided whether Mary actually experienced Physical death. The dogma of the Immaculate Conception states that Mary, was at conception ‘preserved immaculate from all stain of original sin’ and should not be confused with the virgin birth. Mary – Position of Mary is venerated as Theotokos (Greek: ‘God-bearer’). By this is meant that the son she bore was God in human form. She is first amongst the saints and ‘ever-virgin’. Mary was a holy woman who was chosen to bear the Son of God. Her perpetual virginity and intercession are denied. The view is similar to the Orthodox church – the title ‘Mother of God’ being used more commonly than Theotokos. This title forms one of the ‘Marian Dogmas’ of the Church. The others are Mary’s perpetual virginity, assumption and immaculate conception. Pope – Authority of As the Bishop of Rome, he has a primacy of honour when Orthodox, not of jurisdiction. At present, his primacy is not effective as the papacy needs to be reformed in accordance with Orthodoxy. His authority is thus no greater or lesser than any of his fellow Bishops in the church. The Pope is the leader of the Roman Catholic church, having no authority to speak for the church as a whole. The Pope is the ‘Vicar of Christ’ i.e. the visible head of the church on earth and spiritual successor of St. Peter. He has supreme authority (including that over church councils) within Christendom (The Power of the keys). Pope – Infallibility of Papal Infallibility is rejected. The Holy Spirit acts to guide the church into truth through (for example) ecumenical councils. This Orthodoxy recognises the first seven ecumenical councils (325-787) as being infallible. Protestants also reject Papal infallibility. The only source of infallible teaching is that found in the Bible. The Pope is infallible when, through the Holy Spirit, he defines a doctrine on faith and morals that is to be held by the whole church. This is a dogma and is therefore a required belief within Catholicism. Purgatory An intermediate state between earth and heaven is recognised, but cleansing and purification occur in this life, not the next. Purgatory is rejected – Christ’s death on the cross is sufficient to remove the penalty for all our sins. An intermediate state of cleansing and preparation for heaven. Also a state where the punishment due to unremitted venial sins may be expiated. Sacraments There are at least seven Sacraments (known as ‘Mysteries’ in Orthodoxy): Baptism, Chrismation, Eucharist, Holy Orders, Holy Unction, Marriage (Holy Matrimony) and Penance (Confession). The list is not fixed. Generally, only two sacraments (also known as Ordinances) are recognised: Baptism and the Eucharist (often called ‘Holy Communion’ or the ‘Lord’s Supper’). The number of Sacraments is fixed at seven and is the same list as that in Orthodoxy, with the exception of Chrismation, which is generally known as ‘Confirmation’. Sacraments – Effect of The Mysteries convey grace to those who participate in them worthily. There is a diverse range of opinions, but many Protestants regard the Sacraments as symbols or reminders of Grace already given. Agrees with the Orthodox position. The Sacraments are signs that effect that which they signify. Saints A special group of holy people, who are venerated. They may act as intercessors between God and Man and may be invoked in prayer. All Christians are saints, called to imitate Christ. Only Christ may mediate between God and Man. The position is very similar to Orthodoxy. For sainthood, it is also required that at least two verifiable miracles have occured as a result of the intercession of that person. Salvation Salvation is “faith working through love” and should be seen as a life long process. The Ultimate aim of every Orthodox Christian is to obtain Theosis or union with God. This is done through living a holy life and seeking to draw closer to God. Salvation is the free and unmerited gift of God to man. It is obtained by grace through faith in Christ alone. Through Christ’s atoning sacrifice, we are rendered acceptable to God and judged righteous (justified) in his sight. Salvation is by grace, specifically sanctifying grace, which is given initially through Baptismal regeneration and then maintained through the Sacraments, which are ‘channels of grace’. Scripture – Importance of There is one source of divine revelation: Tradition. Scripture forms the oral part, and the writings of saints, decisions of ecumenical councils etc. are also part of it. Scripture alone is the only infallible guide and the final authority on matters of Christian faith and practice (One of the foundational principles of Protestantism). Alongside Sacred Scripture, Sacred Tradition (i.e. teachings handed down from Christ and the apostles to the present) are to be considered sources of divine revelation. Tradition and scripture are interpreted by the magisterium or teaching authority of the church. Worship and Liturgy The ‘Divine Liturgy’ is the centre of Orthodox spirituality. Worship is usually in the vernacular, though Greek is also used. There are a wide variety of worship styles. Examples include the spontaneity of the Pentecostal churches, and the more traditional worship of the Anglican churches and in the Catholic tradition. Worship is centred around the Mass. Following the Vatican II council (1962-5), greater emphasis was placed on worship in the vernacular, though the traditional Latin (‘Tridentine’) Mass is also used. Further details on the Eucharist are given in the Five views of the Eucharist page.